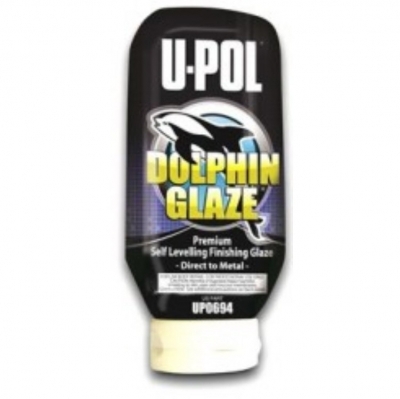 DOLPHIN GLAZE, a premium self-leveling finishing glaze, is ideal for repairing scratches or small surface imperfections. Made from the finest European resins, DOLPHIN GLAZE’s unique formulation is extra smooth, tack free and has unparalleled adhesion capabilities – making it the glaze of choice for professional Technicians. Extra smooth, easy to spread. Flexible, self-leveling, pinhole free formulation. Resistant to solvents in 15-20 minutes. Non-porous formula will not shrink or pull back. Quick drying - sand, paint, prime within 15-20 minutes. Unparalleled adhesion to most substrates including: bare metal, OEM paint surfaces, aluminum, galvanized, SMC, fiberglass, lightly abraded E coat and most plastics.